Four in-depth videos in our online learning center, a powerful self-hypnosis MP3 audio created specifically for hypnotists to experience post-hypnotic success and printable PDF notes/patter (scripts). Be one of the first 100 to register and you can access now for $27. instead of $47. Hypnosis training’s almost always emphasizes the first part of hypnosis, rapport and induction. But after you do an effective pre-talk, induction and suggestive therapy, how do you really get the results to stick? 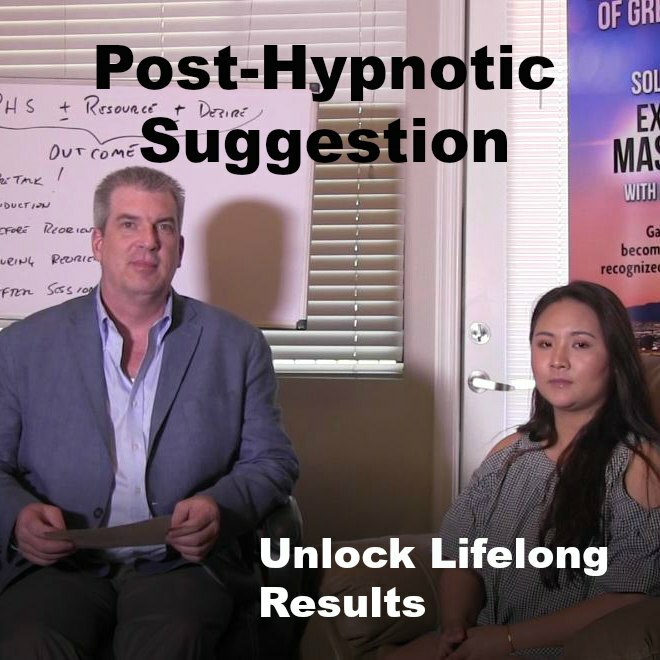 Post-hypnotic suggestion is the key to making hypnosis last forever. Cut your learning curve and move to the expert level. I have been doing hypnosis for 30 years, and the results my clients create really last. Just last night I read some comments someone had written about my session, reporting that 2 years later they were still medication free as a result of the hypnosis session. I had a client who is a doctor, I helped him quit smoking ten years ago, to this day he is still my best referral resource. The key to success like this is not at the beginning of a hypnosis session but in the ending of a hypnosis suggestion. The lasting effect are produced by post-hypnotic suggestion and I will show you exactly how to use PHS and give you scripts you can use to activate success. Do you feel like you have really mastered this post-hypnotic suggestion? You will when you take this course. I just asked the thousands of people to describe the training’s I offer in our online learning center. One of the most frequently used words to describe our courses was: Practical. Two Foundations Videos teaching you post-hypnotic phenomena at an expert level. You want to see these videos because it will give you confidence in your methods and help you to deliver post-hypnotic suggestions with power. Two Techniques Videos where I show you how I deliver post-hypnotic suggestion with a client. You want to see these videos because when you learn these techniques you will improve your outcomes, and that means more referrals and higher fees and a fuller schedule. Printable PDF Course Notes: Patter and scripting to help you go into each session with a plan for delivering and using post-hypnotics. You want this because the PHS form I provide can be used as a guide in session and give you the tools for creating planned and powerful post hypnotic suggestions. MP3 Audio Session: I created this self-hypnosis session for hypnotists to spur creativity in crafting the right post-hypnotics, and loaded the script with post-hypnotic suggestions! The easiest way to move to an expert level as a hypnotist is to experience hypnosis, and you will want this MP3 so you can experience for yourself, the success your clients are going to have. I guarantee this concise step-by-step course, will be one of the most practical training’s you have taken. It is short but powerful, and it is easy to follow. I am so confident you will find value in this course, if you don’t benefit from this course, let me know and I will send you your $27 back. Click the red button to add this to your cart and you will have access immediately to all of these course materials. Don’t go into your next session doubting if the impact of your hypnosis will last. Keep the momentum of your sessions going right to the very end. Start building your reputation as a results oriented hypnotist and access these course materials right now. P.S. Click the red button to add to your card, and you will reap the benefits almost immediately of creating lasting results in hypnosis: Increased referrals, successful outcomes, satisfied clients, and confidence in your methods.